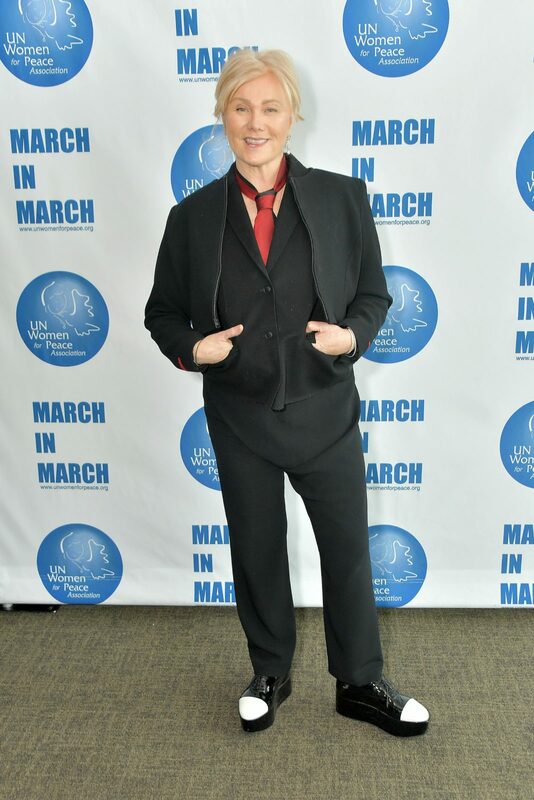 She’s known for her relaxed and effortless style at public events, but Deborra-Lee Furness didn’t disappoint in the fashion department as she stepped out in a striking all-black ensemble to attend the UN Women For Peace Association 2019 Awards Luncheon in New York City on Friday, to mark International Women’s Day. The Aussie actress, 63, looked incredible in the standout outfit that included a chic jacket and trousers, which she teamed with black-and-white platform brogues — adding an edgy flair to the relaxed look. Deborra-lee completed the bold ensemble with a statement red necktie, and wore her hair tied back in an effortless style for the event. She also opted for flawless make-up, keeping things simple with a hint of blush and a pink lip. Noticeably missing from Deborra-Lee’s side was her hunky husband, Hugh Jackman, who is currently promoting his upcoming show ‘The Man. The Music. The Show.’ in Sydney. As part of Hugh’s tour, he’ll perform some of the most loved and well-known songs from musicals including The Greatest Showman and Les Misérables, as well as other Broadway shows which will likely include his past role in The Boy from Oz. The Aussie entertainer confirmed he will be accompanied on stage by a live orchestra – no doubt putting on an incredible show following his success in hit musicals over the years. Hugh will kick off the tour in Europe in May before performing to fans in London. He’ll then jet to the United States and his North American leg will begin in Houston, before heading to New York’s Madison Square Garden and Los Angeles’ Hollywood Bowl. He’ll then end the tour in his home country of Australia. Last month, international fans were treated to a spectacular performance when Hugh opened 2019 Brit Awards with a show-stopping musical number. The 50-year-old actor opened the awards ceremony with a stunning rendition of ‘The Greatest Show’ from the wildly popular musical, wearing a glittering jacket and even showing off some amazing dance moves. For that performance, he was joined on stage by circus performers in tops hats and tails, fire-breathers and a pyramid of backing dancers. The actors met on the set of the Australian drama Corelli in 1995 and have been going strong ever since. Hugh and Deborra-Lee, who will celebrate 23 years of wedding bliss in April, have two children together, 18-year-old Oscar and 13-year-old Ava. Are you a fan of Deborra-Lee Furness? Do you like her style?